Two-Shot Injection Molding Materials | Thumb Plastics, Inc. Thumb Plastics, Inc. offers a wide variety of materials to meet your two-shot injection molding needs. Whether your project calls for HDPE injection molding, polypropylene injection molding, ABS plastic molding, PVC injection molding, or something else, our FEA engineers have the expertise to help you determine the ideal part design and material for your application. To realize the full benefits of the two-shot injection molding process, you should choose two compatible materials that can form a molecular bond while simultaneously meeting the functional requirements of your part. With literally hundreds of materials and thousands of ways to adjust, blend, fine-tune, and combine them, we strongly encourage you to speak with your material supplier or injection molder early on in the design phase of your part. 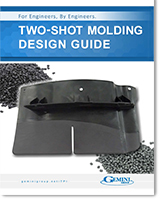 To learn more about two-shot injection molding material selection and design, download your free copy of our Two-Shot Design Guide.